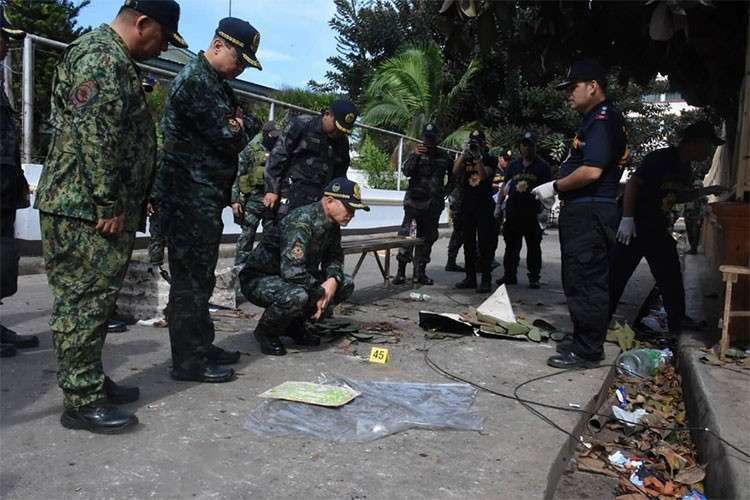 SULU Police Provincial Office Director Pablo Labra confirmed Friday, February 1, that suicide bombers were responsible for the twin explosions in Jolo, Sulu over the weekend. He said investigators obtained affidavits from 36 witnesses who were among those injured when two explosions hit the Our Lady of Mount Carmel Cathedral on January 27. According to witnesses, a man and a woman, whom they suspect were a couple, entered the cathedral. The woman was at least 5’2” in height, with slim figure, and was wearing a gray hoodie jacket where the bag containing the explosive could have possibly been concealed. Witnesses said the man left the woman before the first bomb went off. “Sa cathedral, kilala nila ang isa’t-isa na nagsisimba. Itong mga witness natin, na-caught ang attention nila dahil hindi familiar ‘yung babae. Nagsabi sila sa investigators na suspicious ang actions ng babae. Accordingly, lingon ng lingon; that somehow caught the attention of our witnesses (The churchgoers know each other. Our witnesses noticed a woman who acted suspiciously),” said Labra. He said investigators are inclined to believe that the woman was responsible for the first blast, while investigation on whether the man was behind the second explosion is ongoing. He added that according to the Explosives Ordnance Division, the second explosive was suspended, or was not placed on the ground. It could be hanging or being carried by a person, he said. He said another indication that the blasts were perpetrated by suicide bombers is that there were two pairs of feet with no claimants. “Lahat ng namatay accounted, confirmed and identified by their families. Merong dalawang pair of feet na andyan na one pair, by its appearance could be belonging to a lady and another to a man...(These are) subject to DNA testing,” said Labra. From 21, the fatalities climbed to 22 on Friday, February 1, with the death of Thelma Villanueva, 68. Authorities said Villanueva expired after her family decided to have her life support removed. Labra said the affidavits of the witnesses and the pieces of evidence gathered from the blast site matched the intelligence reports gathered earlier. Intelligence reports said a man and a woman will stage a bombing incident. As to the nationality of the "suicide bombers," Labra said it is still being investigated. Earlier, Defense Secretary Delfin Lorenzana identified the suicide bombers as a Yemeni couple, who was among the at least 40 foreign terrorists who entered the country. He ruled out the possibility that Filipino terrorists can do such brutal act. The Jolo cathedral explosion was the second suicide bombing incident in the country. The first happened on July 31, 2018 in Lamitan City, where the improvised explosive device was placed inside a van and detonated by its Moroccan driver after he was cornered by security forces in a checkpoint.